I was invited as an expert by the Council of Europe, to their ‘Protecting Whistleblowers’ conference to the Palais de l’Europe in Strasbourg – representing atlatszo.hu. They have since then come up with a preliminary report, which will be the basis of formulating new laws to protect whistleblowers. 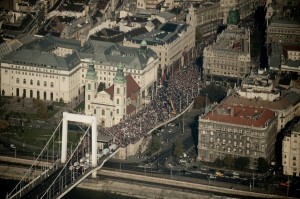 Images of the Milla Demonstration on October 23rd, 2012, as we flew over the Gellért hill. Photos taken by Balázs Glódi. Our investigative journalism project, atlatszo.hu, has been declared as one of the winners of the Breaking Borders Award, at the Global Voices Citizem Media Summit 2012 held in Nairobi, Kenya. my presentation at the Paradigm Shift in Copyright conference, organized by the Asimov Foundation.